Many web developers have moved over to TypeScript in place of CoffeeScript because of convenience and features. And with the release of ES6 it seems even more likely that CoffeeScript has been replaced. But there’s still an audience for the scripting language whether working behind Ruby or just in a legacy production. Learning CoffeeScript should not be difficult and CoffeeScript in Action makes the process pleasing and, dare I say, even fun. 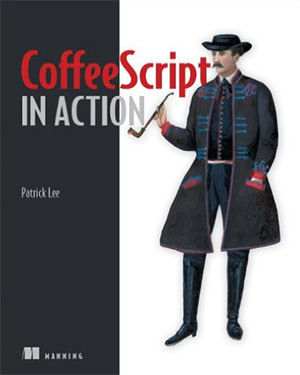 Over 430 pages this book teaches you why to use CoffeeScript, when to use CoffeeScript, and how to properly apply it to everyday project work. The chapters are split up into three parts: Foundations, Composition, and Applications. The first part teaches fundamentals while the last two parts cover detailed programming and completed work. The first section explains CoffeeScript mechanics including syntax and behaviors. You learn a little about OOP which quickly moves you into the second section. There is a drastic leap in difficulty between these two sections so be prepared for that. In part 2 you’ll study functional programming and asynchronous development. This teaches you through real-world applications how to build apps with CoffeeScript. I noticed the author often tries to connect real-world situations into the workflow. This can help you understand when CoffeeScript would work best and how to apply it appropriately. The third part teaches you about unit testing and expanding CoffeeScript through modules. In the very last chapter the author waxes philosophical about ECMAScript and how this affects CoffeeScript development. Unfortunately the growth of ES2015 is probably the largest issue I have with any CoffeeScript book: not the writing or content, but the language itself. I would personally rather learn TypeScript over CoffeeScript and I don’t see that trend changing anytime too soon. Here’s a quick breakdown of the pros & cons before I go into greater detail. All of the actual writing in this book is fantastic. It’s super clear and the authors know what they’re trying to say. I also think the examples are top notch. Each example includes common problems that most developers face along with solutions to those problems. This guide will hold your hand and help you walk through CoffeeScript with confidence. I think the biggest downside is the fact that almost nobody wants to learn CoffeeScript anymore. It’s not a bad language. But it’s just not relevant compared to ES2015. I found it to be somewhat annoying and it dragged on for far too long. But I can’t knock off too many points for the authors being extra careful about their readers’ knowledge base. If you’re adamant about learning CoffeeScript then this book will teach you the theory, the practice, and the workflow to apply it all. And for that I have to give the authors a lot of praise. But if the applications aren’t useful in modern web development then I’m not sure I can recommend this outright to developers. It’ll teach you CoffeeScript and it’ll teach it to you well. But how you use it is another subject altogether. But truthfully studying ES2015 and/or TypeScript would be a much better use of your time. This is sad to say because CoffeeScript in Action is a brilliant book. It’s very well written and it teaches the concepts well. I’m always impressed by Manning’s work and this title is no exception. If you genuinely need to learn CoffeeScript for any reason then I would recommend starting with this book. If you’re just looking for a scripting language to learn I’d honestly recommend TypeScript instead. For that I’d recommend Learning TypeScript which is a brilliant introduction to that language. For learning practical CoffeeScript in a way that applies to real scenarios I would definitely recommend CoffeeScript in Action.